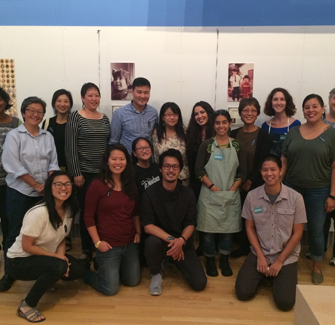 Arts + Advocacy: Citizenship for All Adoptees was free program open to the public. It offered many different ways for people to learn about adoptee citizenship, help pass the Adoptee Citizenship Act and connect with each other. 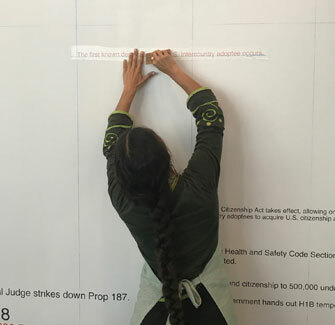 The program occupied two spaces at Yerba Buena Center for the Arts: The Sanctuary Print Shop and The Party of Migrant People’s Assembly Space inside of the exhibition “Tania Bruguera: Talking to Power.” It was a highly collaborative effort. 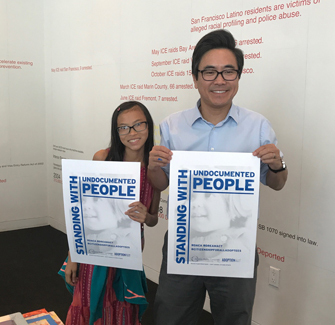 The Adoption Museum Project played several roles in making Arts + Advocacy: Citizenship for All Adoptees happen: help shape the concept and program design, manage poster making, add adoption events to the immigration timeline, and create a handout with a historical overview of the adoptee citizenship. Many people were part of our team: Suzi Martinez Carter, Kelly Condit-Shrestha, Leslie Griep, Priya Kandaswamy, Zoe Klein, Terri Lambert, Kate Lawlor, Jessica Jin Lee, Kim Park Nelson, Alex Peter. We are grateful to each of them. We are also grateful to Yerba Buena Center for the Arts, and artists Sergio De La Torre, Chris Treggiari and Tania Bruguera. Their commitment to community-based arts and advocacy made Arts + Advocacy: Citizenship for All Adoptees possible.